There were so many British rock groups in addition to The Beatles! The Rolling Stones, The Troggs, Chad and Jeremy, The Bee Gees, Gerry and the Pacemakers, The Animals, Peter and Gordon, Herman's Hermits, The Dave Clark Five, Freddie and the Dreamers, Petula Clark, Wayne Fontana and the Mindbenders, Donovan, Manfred Mann, and more were all part of this mid-'60s phenomenon. My older sister was in her teenage years during this time and turned me on to all these artists. 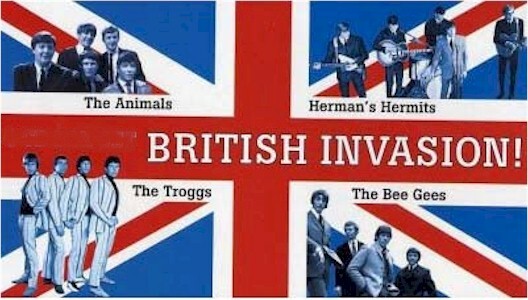 To this day the 60's British Invasion is my favorite period in music. Loved all of those but didn't buy records or tapes of any... got later on a CD with best of most of them. Posters covering my walls, had a crush on Carl of Herman's Hermits. Songs were played and played back then, received much air time, unlike today---too many radio stations to choose from. Had many 45's and albums.